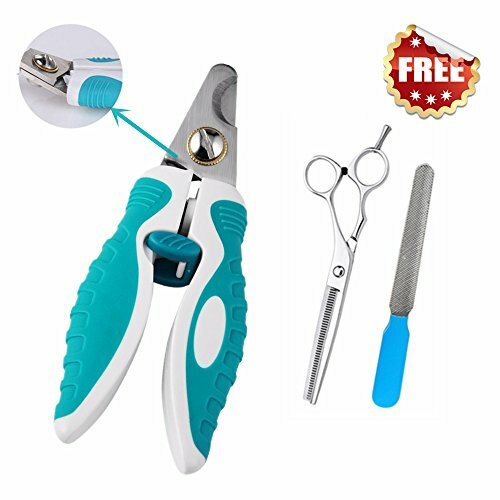 Pet Nail Trimmers: including dog toenail clippers, Grooming Scissors, nail file.Give your beloved pet a perfect gift! Angled Professional Grade Blades without Blocked View - Features angled tips, heavy-duty curved blades in tamped 3.5mm high-carbon stainless steel ensure professional clean, even cuts and sharp edge retention with enhanced flexibility and ease of use. The absence of unsafe \"safe guard\" allows you a clean view, which actually reduces the risk of hurting your pet! SAVE YOUR TIME AND MONEY - there\'s no need to spend money at the vets and groomer when you can confidently clip your dog\'s nails and comb dog\'s hair at home! ERGONOMIC AND EASY TO USE - Non-slip rubber handles that are ergonomically designed for a comfortable grip and ensuring a safe nail trimming experience for you and your dog. Treasure your dogs,LIke your family.-Bestsl Professional Pet Supply seller with a lifetime warranty and 90-day 100% money back guarantee. what a great grooming set and it's so easy to use. My ferrets nails were so easy to trim.